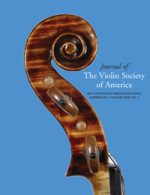 In 2011 Tarisio collaborated with the Violin Society of America (VSA) to create a searchable online version of the VSA’s 40-year collection of journals. Contents include articles on all aspects of bowed stringed instruments, auctions and appraisals, history of the violin and performers, playing technique and performance practice, making and restoration, tools, varnish, wood, graduation and acoustics. Tarisio is delighted to host the online collection, which is available to all VSA members. Visit the VSA Journal online.